On 23 July 2018 the State Hermitage held a Day of the National Museum of the Sultanate of Oman. The programme for the day began with a scholarly conference. Speeches of welcome to those attending were made by Mikhail Piotrovsky, General Director of the State Hermitage, and His Excellency Hamad bin Mohammad Al-Duyani, Head of the National Records and Archives Authority of the Sultanate of Oman. Orientalists from Russian and abroad took part in the scholarly meeting. The papers presented were devoted to the history and culture of the Sultanate of Oman. The conference included a showing of the film Oman: Pearl of the Orient in the Land of Hope and a concert by the Royal Oman Symphony Orchestra. 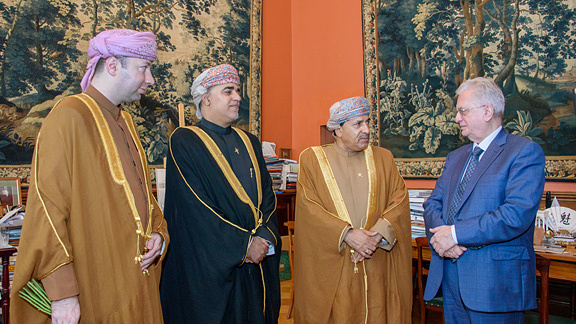 One of the most important events of the day was the opening of the exhibition “Oman in the Hermitage”, which has been organized by the Hermitage in conjunction with the National Museum and the National Records and Archives Authority of the Sultanate of Oman. In 2015 the State Hermitage and the National Museum of the Sultanate of Oman signed a Memorandum of Understanding in the sphere of cultural collaboration. The agreement is aimed at strengthening relations, deepening mutual understanding between the cultures of the two countries, collaboration and development of the museums in the long term. As part of this project there have already been several working visits to the State Hermitage by staff of the National Museum. Most attention within the programme for the exchange of experience was devoted to acquainting colleagues with the Hermitage’s restoration activities. The exhibition “Oman in the Hermitage” presents items dating from the heyday of the Omani Empire that are connected with the ruling dynasty. The works of jewellery and book art from the collection of the National Museum of the Sultanate of Oman tell about the historical and cultural diversity of the Omani Empire. The exhibition curator is Dmitry Sadofeyev, a researcher in the State Hermitage’s Department of the East. An illustrated booklet in Russian has been prepared for the exhibition with a text written by Mikhail Piotrovsky (State Hermitage Publishing House, 2018). The exhibition “Oman in the Hermitage” will function in Apollo Hall of the Winter Palace from 24 July to 16 September 2018.